There’s a growing trend in social media that cannot be ignored or glossed over by left-bias media. Conservatives are standing up to liberal lies on Twitter  in droves. And it’s making an impact. Conservative “tweople” – people who use Twitter  – have successfully hijacked several liberal hashtags over the past year with hilarious results. For example, the hashtag #YesWeDid – a nod to the successful 2008 Obama campaign slogan meant to tout the accomplishments of the Obama administration – began trending earlier this week. But in addition to the usual fawning over Obama, conservatives took to Twitter and turned the hashtag trend on its head by tweeting the ugly truth about the Administration. @sinkspur: There's as much negative Obama news on #YesWeDid as positive. It's great fun. @PolitiBunny: #YesWeDid stand over coffins of4 murdered Americans& lie2 families in order2 steal election #Benghazi"
@_MNmisfit: #yeswedid stuff hundreds of ballots in ballot boxes. Then deny nope no voter fraud here....."
@AIIAmericanGirI: Liberals/Democrats/Socialists/Communists commit nearly all mass shootings: #yeswedid They are no.1 in the mass shooting department. 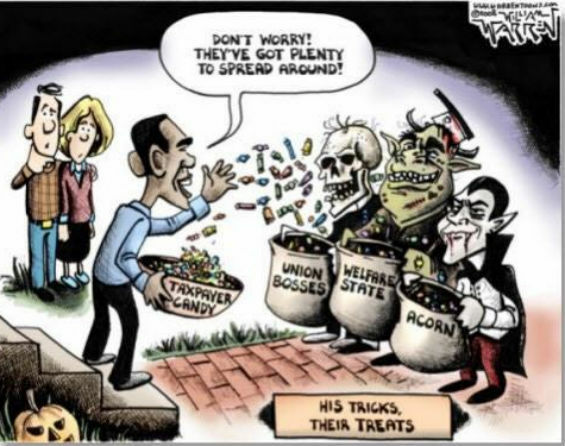 This Halloween season, the hashtag #LiberalHalloweenTraditions is trending. Do you have what it takes to annoy a liberal this Halloween? Tweet your best #LiberalHalloweenTraditions tweet to @RichardViguerie  and we’ll share it here. Need some inspiration? See the latest #LiberalHalloweenTraditions tweets on Twitter here .